Renowned golf course architect, Clyde Johnson, used famed Winged Foot and Augusta National as his inspiration when he designed Shaftesbury Glen. 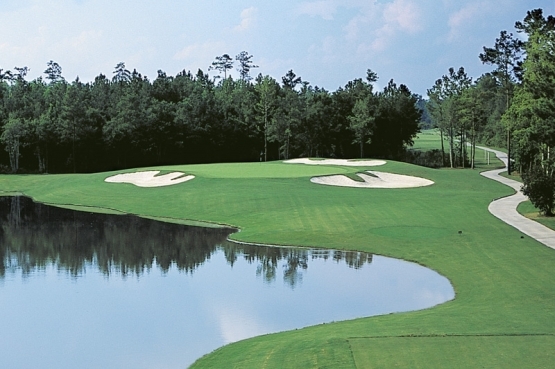 This Myrtle Beach golf course is a traditional English style layout. When you arrive at Shaftesbury Glen you will be greeted at the Shaftesbury Glen English manor clubhouse that features a fully-stocked pro shop, restaurant and bar. The old- style rectangular tee boxes lead to wide open fairways that lead to large, elevated Bent grass greens that are protected by bunkers. Shaftesbury Glen is home to a new Myrtle Beach golf school, the South Carolina Golf Center and would be a perfect place to take Myrtle Beach golf lesson from a renowned Myrtle Beach golf instructor. This award winning golf course has garnered awards such as Myrtle Beach Golf Course Owners Association “Golf Course of the Year” 2009, “one of the Top 50 Golf Resorts” by readers of Golf World 2009, “Among the Top 22 South Carolina’s More Than 300 Golf Courses” by Golf World and Golf Digest “Places to Play” 2005. Myrtle Beach Golf Authority golf packages can include Shaftesbury Glen with any other outstanding Myrtle Beach golf courses to create the ideal package for you. While visiting Myrtle Beach be sure to check out some of the fantastic Myrtle Beach entertainment such as Broadway at the Beach, Barefoot Landing and the Myrtle Beach Sky Wheel. Today is the perfect time to book a Myrtle Beach golf package! Nice course, a little off the beaten path, but not too far. Friendly staff. Lots of wildlife. The course was in good shape, pace of play was great. I would recommend this course to anyone.